Start by priming the face and eyelids with eye and facial primer, then apply your normal foundation to one side of the face. 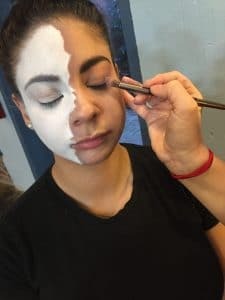 We’re using MAC products for the “normal” side and Kryolan for the “mask” side. Using a thin brush and your white Kryolan, draw a jagged, curved, or generally uneven line dividing the face almost in half. This line marks where the “mask” begins, so try not to make it too straight! 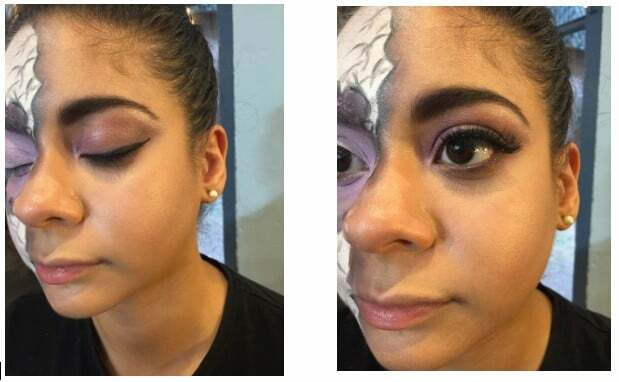 You want it to look like it could come right off your face. Now apply the rest of the Kryolan on the side of the face you didn’t apply foundation to. 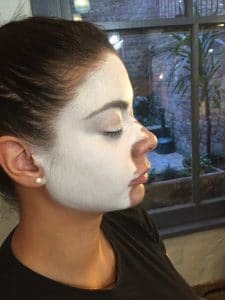 Set the white makeup with a translucent powder, and then follow up with a second coat – this makes the white pigment stand out and helps create that 3D look you’re going for. 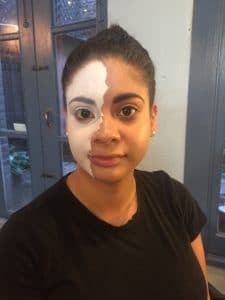 Pick the second darkest “bruise” color from your Kryolan palette, and blend it into the white line to create a shadow into the white cream makeup. 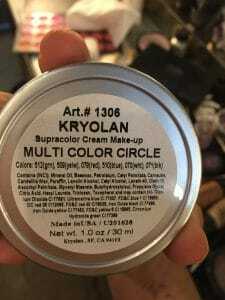 Repeat this process with the darkest color from the Kryolan palette. Transition to the foundation side of your face, and start by applying a purple eye primer (we used Urban Decay) and a bold, fun eye color. 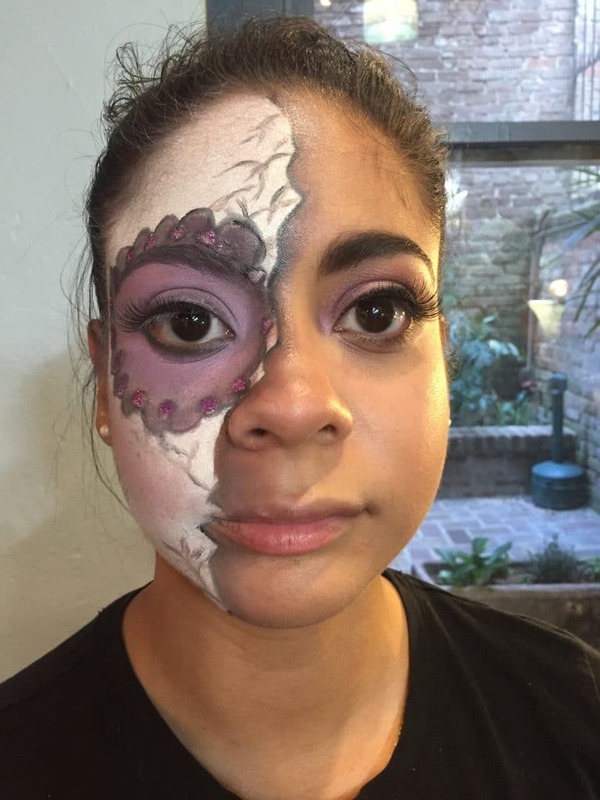 We’re using a light purple from the Kryolan “Death” palette, but this can really be anything you want! Apply over the entire eyelid then use a brown shadow to shadow underneath the bottom eyelid. 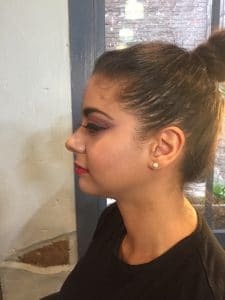 Contour the cheeks with a dark foundation on the temples, cheekbones, jawline, and on both sides of the the side of the ridge of the nose. Dust with a little shimmering powder, and voila, 10 extra glamour points for you. Now it’s time for the fun part! Apply a white primer to the mask side eyelid, then brush on the same light purple color you used on the first eye. 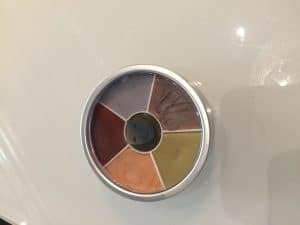 Apply this color all over the lid and then in a growing circle around the eye in whatever shape you want (see image) to create a ½ inch thick border circle around the eye. Follow up by blending a darker purple to line the outermost edge of the circle. 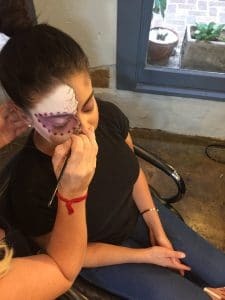 Contour the mask side of the face with the darker purple. Using a very thin brush, draw in small cracks (think of drawing tiny tree branches) and then go over with a small amount of black Kryolan to emphasize. Use a smaller brush and reinforce the edge of the mask with black Kryolan. Use prosthetic glue and a Q-Tip (to avoid cleaning glue and glitter out of a brush) and apply dots around the eye color circle. Use another Q-Tip to place glitter on the glue. Now you can get creative – use a small brush and the black Kryolan to outline the glitter, connect the dots – whatever you want! Finish up by lining the normal eye with a black liner (we did a classic cat eye) and applying false lashes. Pick a statement lip color like red, purple, or full on glitter lips. Wrap up the look with a setting spray!